March 10: The March 10th blizzard in Fargo adds to the snowfall and frozen precipitation already accumulating in the southern Red River Valley. March 24: Snowplows pile all of the downtown snowfall in one place along the Red River. This photographer visited to see what was lost. Among the piles of lighters, gloves, and telephone boxes, there was a ten dollar bill. Not quite enough for flood insurance. Fargo giveth, and Fargo taketh away. March 24: Ice and debris jam at 12th Avenue North toll bridge, Fargo, North Dakota. This photo shows why this "floodable" bridge is an ill-conceived structure, acting to impede water and ice movement during times of flooding. Red River stage (at Fargo): 32.4'. 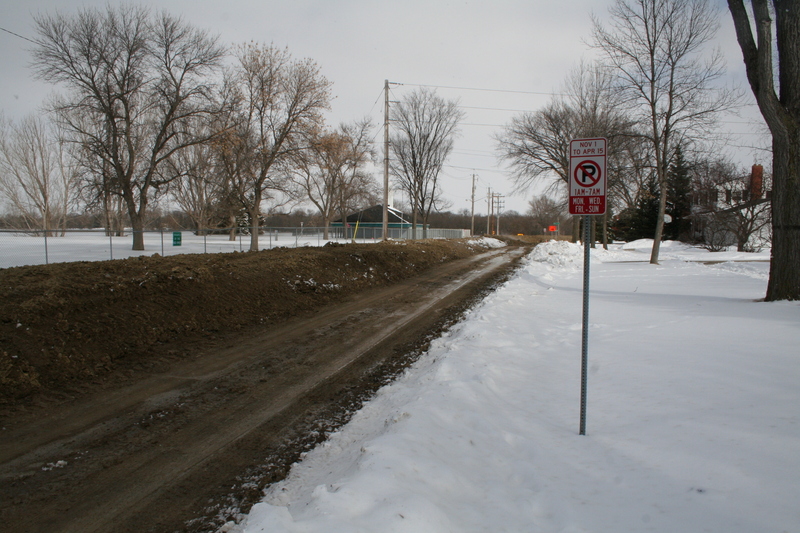 March 24: Construction of a temporary earthen dike along 14th Ave. N, just south of El Zagal Golf Course, Fargo, North Dakota. Red River stage (at Fargo): 32.4'. March 24: Waters of the Red River inundate Elm Street N, just east of the dike at El Zagal Golf Course, Fargo, North Dakota. Red River stage (at Fargo): 32.4'. Waters topped the dike the night of March 25th. 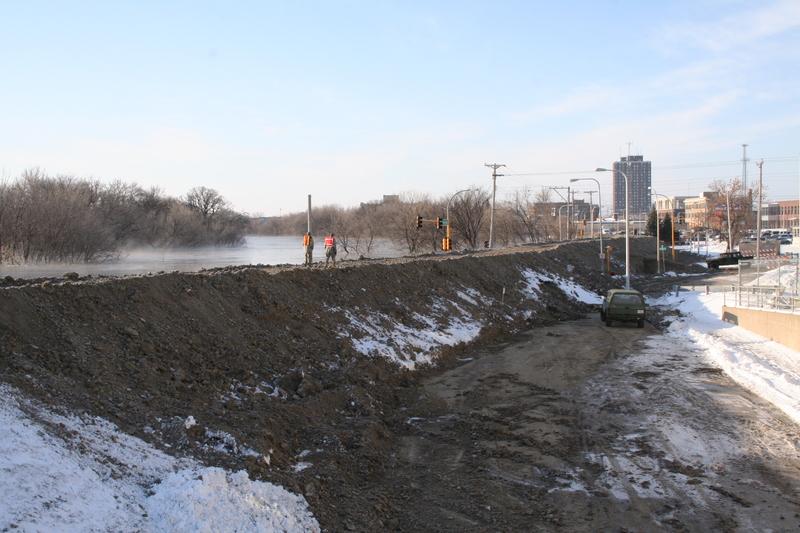 March 24: Construction of a temporary earthen dike along Oak St. N, looking south from 11th Ave. N, Fargo, North Dakota. Red River stage (at Fargo): 32.4'. 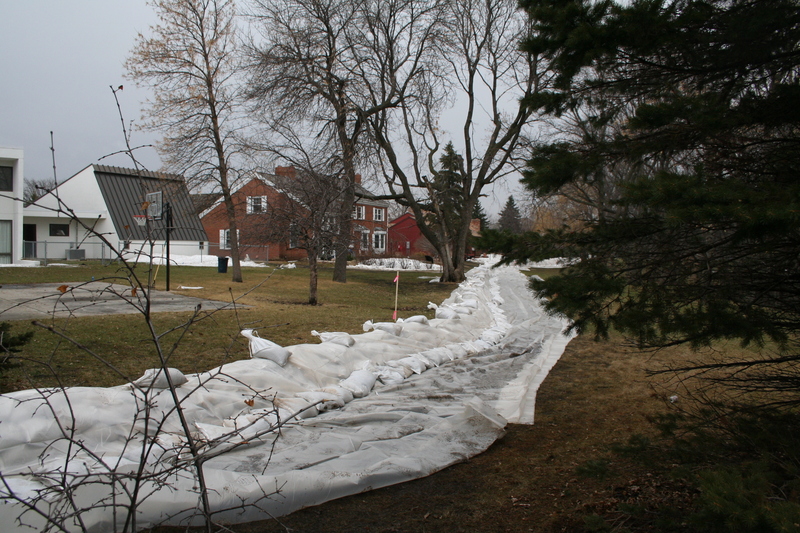 March 24: A sandbag dike was quickly constructed today at Elm Circle, Fargo, North Dakota. Thanks go to the many, many volunteers who helped fill and pile the sandbags. Red River stage (at Fargo): 32.4'. 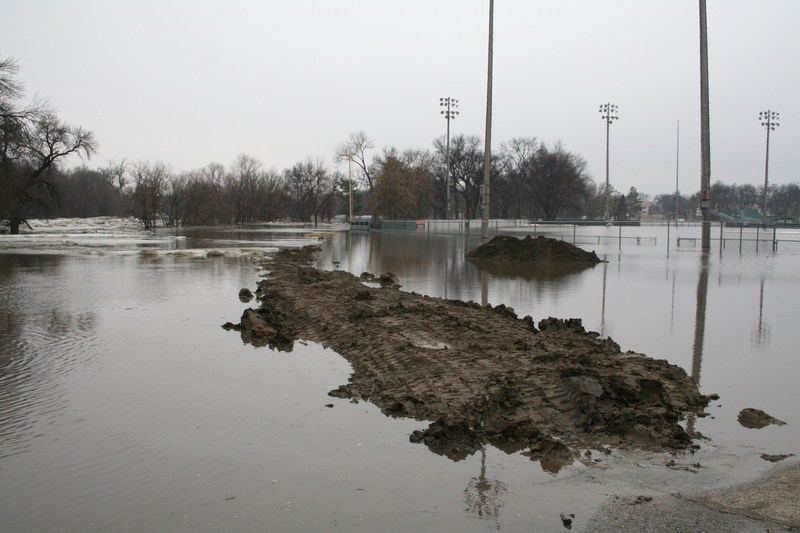 March 24: What was intended to have been a temporary earthen dike to protect Legion Field in Fargo gets overwhelmed by the developing flood, as does the baseball field itself. Red River stage (at Fargo): 32.4'. March 25: The thaw ends, as temperatures plunge below freezing. 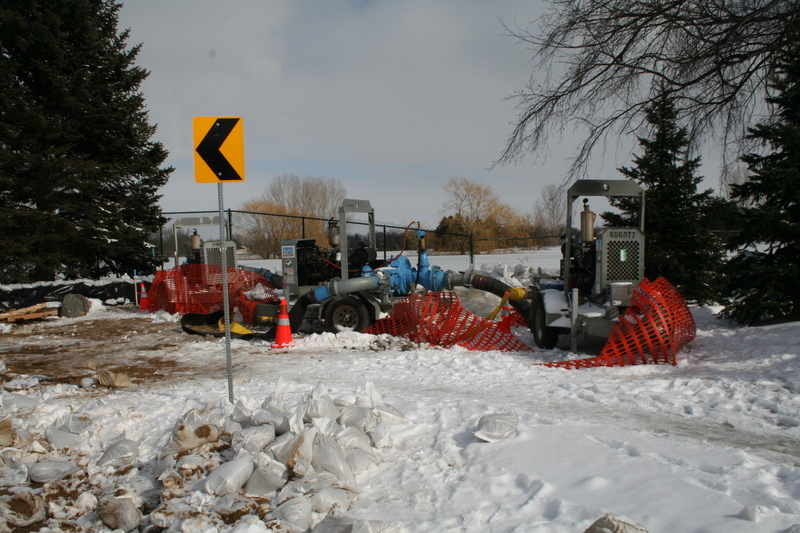 Heavy snows fall, impeding temporary dike construction. 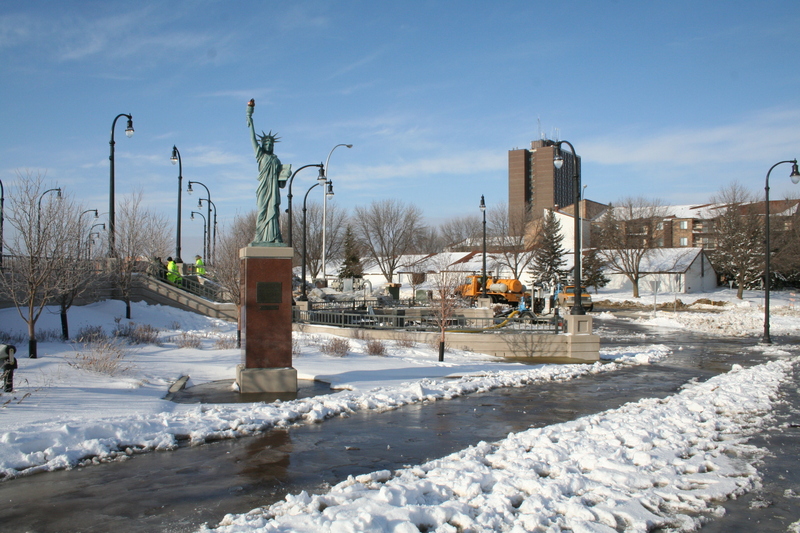 View is south from the Main Avenue bridge, Moorhead, Minnesota. Red River stage (at Fargo): 36.6'. 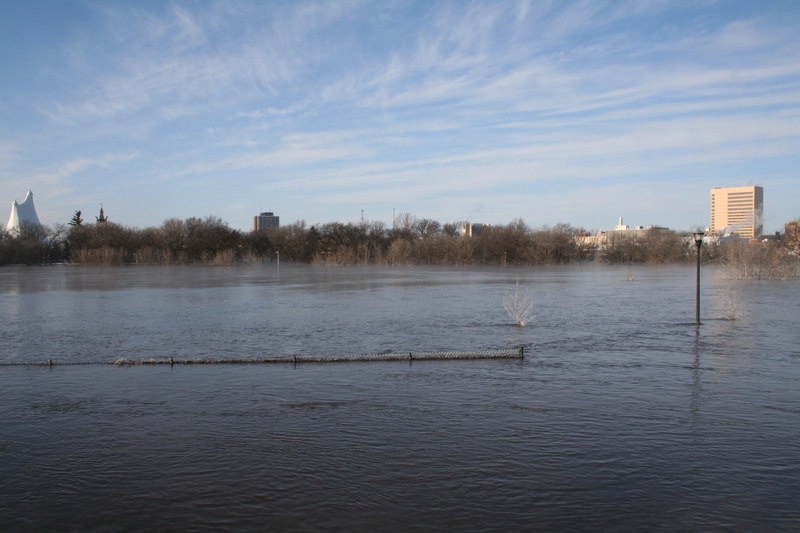 March 25: As floodwaters rise, the bridge at Main Avenue becomes one of the last functional traffic bridges across the Red River. View is to the east from Fargo, North Dakota. Red River stage (at Fargo): 36.6'. 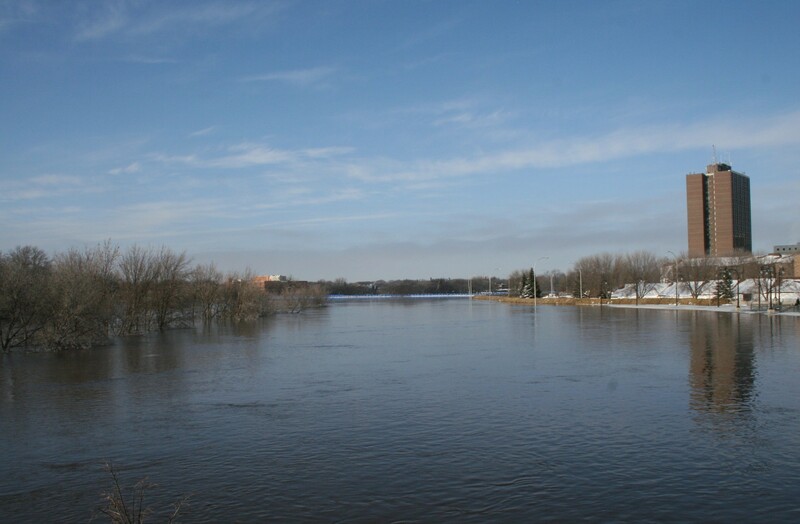 March 25: North 3rd Street in Moorhead, Minnesota, is inundated by the rising waters of the Red River. Street lamps show the position of the street. Red River stage (at Fargo): 36.6'. 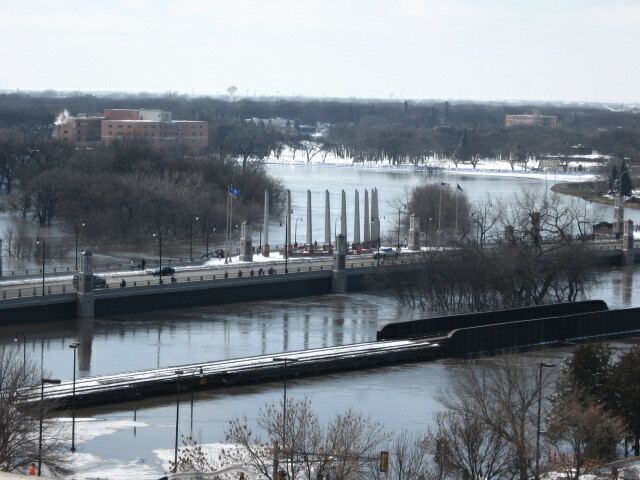 March 25: Bridges across the Red River, view facing west toward Fargo. To the right is the Center Avenue Bridge. To the left is a bridge for the BNSF Railroad. To the left, distant, is the Main Avenue Bridge. Red River stage (at Fargo): 36.6'. 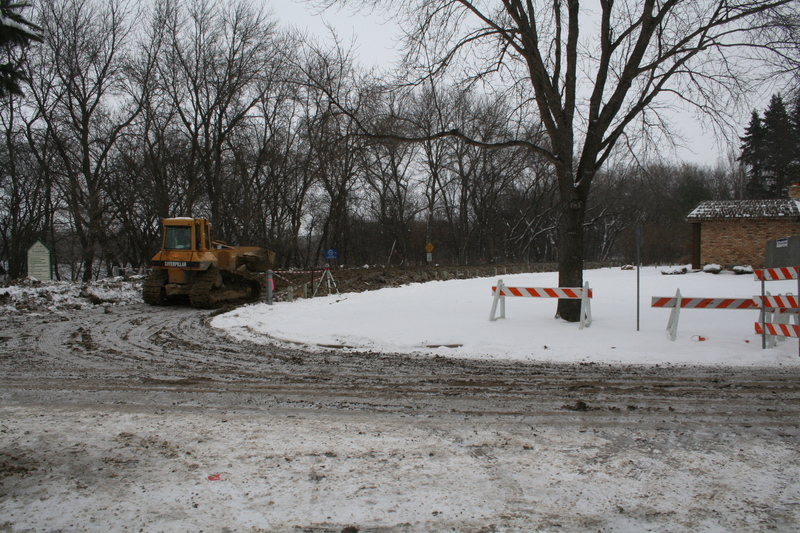 March 25: In preparation for expanding an existing sandbag dike, snow is removed. Woodcrest Drive, Fargo, North Dakota. 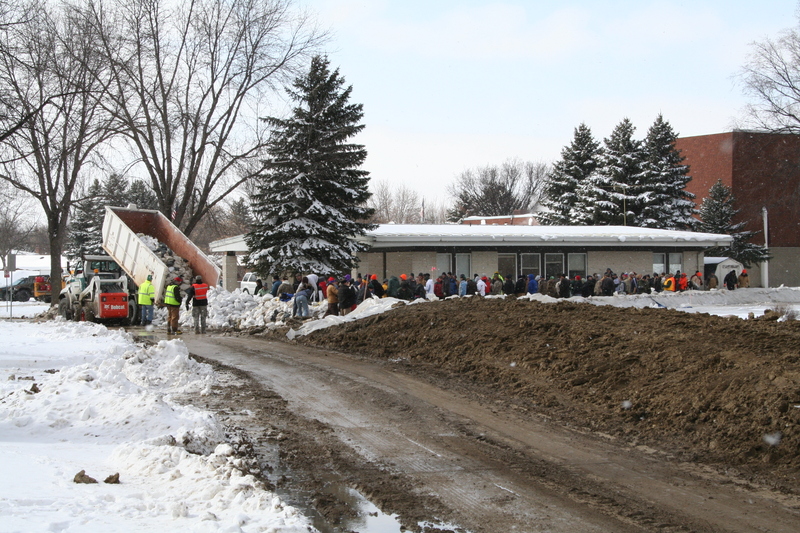 March 26: Busloads of patient volunteers receive instructions on how to expand an existing sandbag dike. Woodcrest Drive, Fargo, North Dakota. March 26: Tough guys: everyone joins in in a massive volunteer effort to construct miles and miles of sandbag dikes. Fargo, North Dakota. March 26: Hesco bastion barriers were originally designed as blast walls, that could be quickly assembled in military zones. 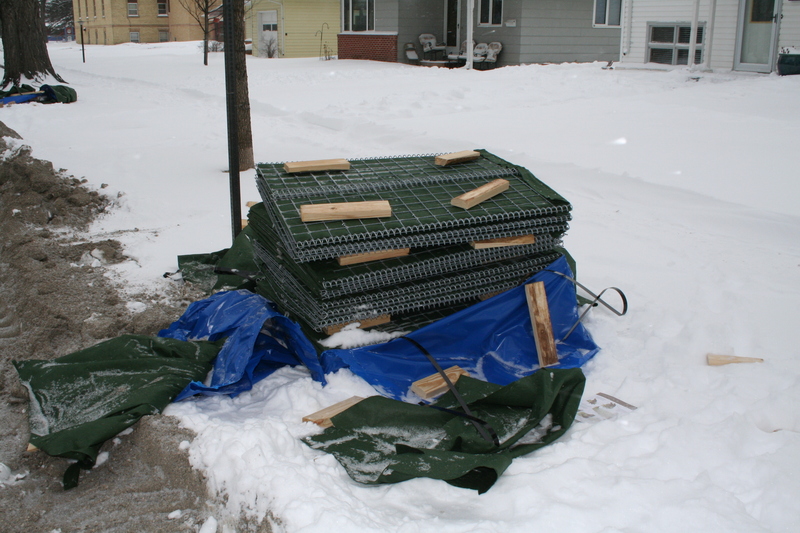 They are gabions (i.e. wire cages), covered with a liner and then loaded with sand. 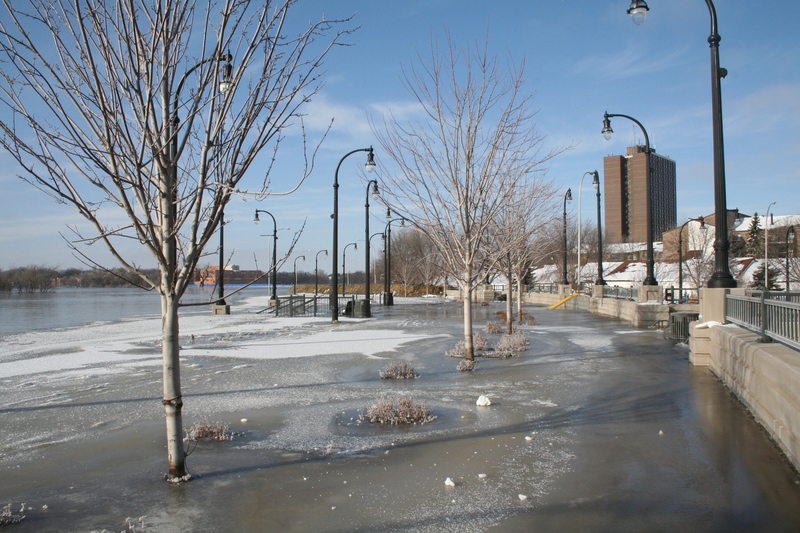 They assemble quickly and now serve Fargo as effective floodwalls. This photo shows the "kit." 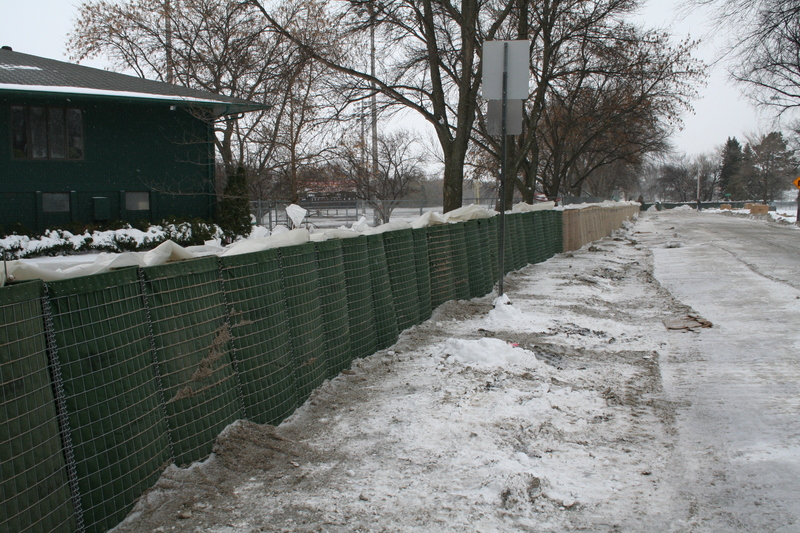 March 26: Hesco bastion barriers assembled as flood walls, Legion Field, Elm Street N and 12th Ave. N, Fargo, North Dakota. Red River stage (at Fargo): 39.6'. 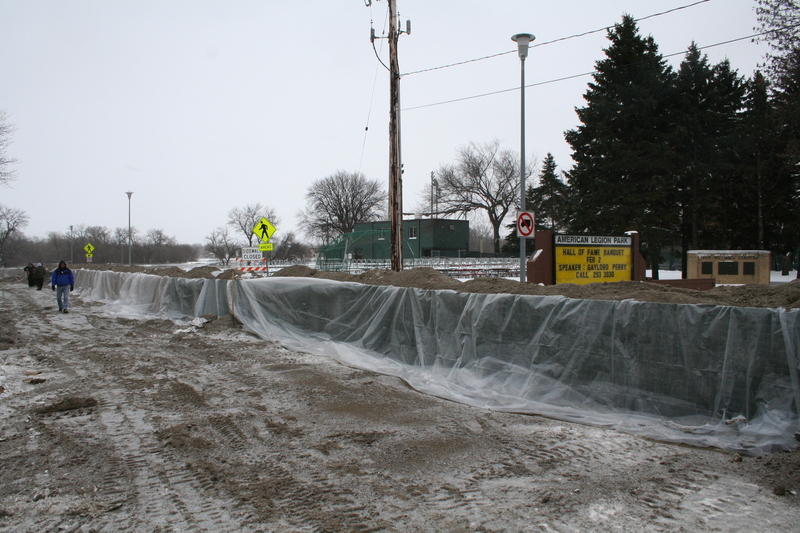 March 26: Hesco bastion barrier merging into a sandbag dike, 11th Avenue N. and Elm Street, Fargo, North Dakota. Red River stage (at Fargo): 39.6'. 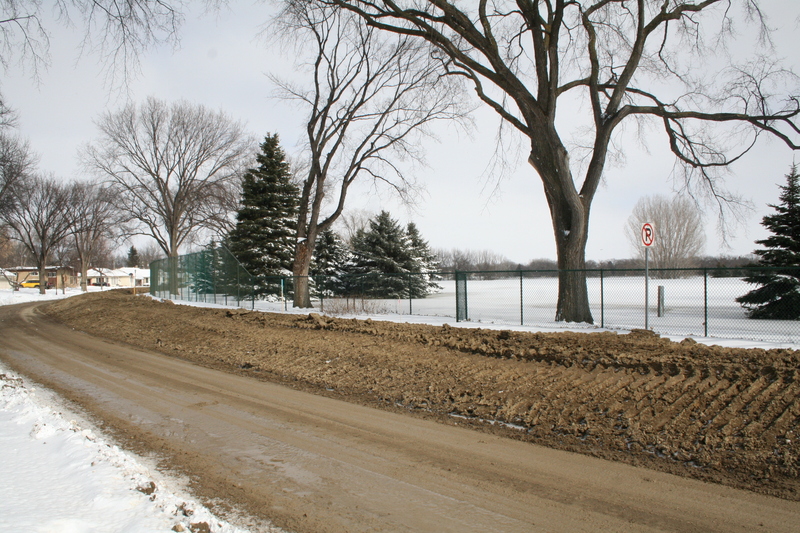 March 26: Temporary clay dike being constructed at entrance to Trefoil Park, Elm Street N and 14th Avenue N, Fargo, North Dakota. Red River stage (at Fargo): 39.6'. March 26: Elm Street N and 14th Avenue N, Fargo, North Dakota. Red River stage (at Fargo): 39.6'. March 27: At 2 a.m, ambulances line up at MeritCare Hospital (the largest hospital in North Dakota) to assist in the evacuation of patients. Fargo, North Dakota. 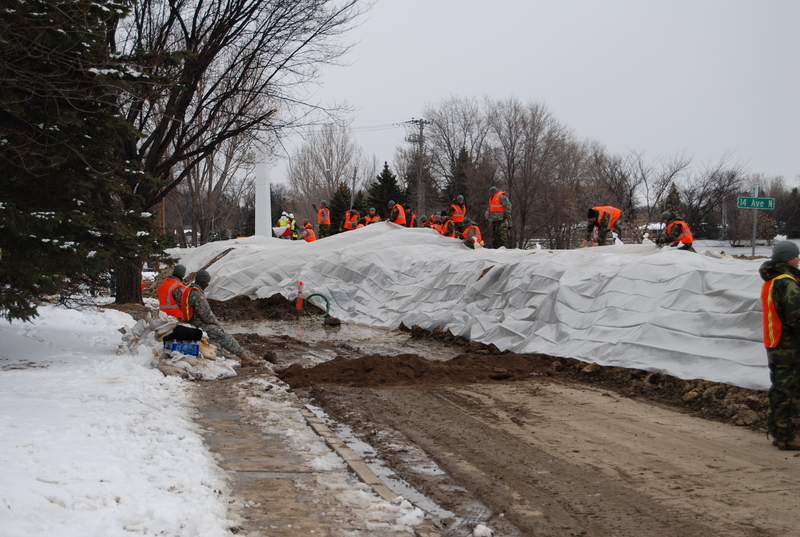 March 27: Sandbag crew reconstructing temporary dike at south edge of El Zagal Shrine, 14th Avenue N, Fargo, North Dakota. Red River stage (at Fargo): 40.7'. March 27: Sandbags, with sandbags on top of permanent dike. West end El Zagal Golf Course, 3rd Street N, Fargo, North Dakota. Red River stage (at Fargo): 40.7'. 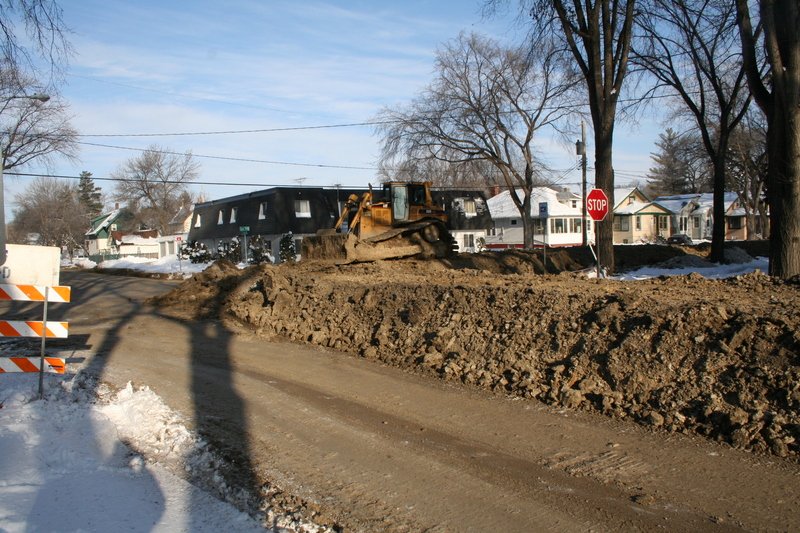 March 27: Temporary earthen dike along 14th Avenue N at Oak Street N, Fargo, North Dakota. Red River stage (at Fargo): 40.7'. 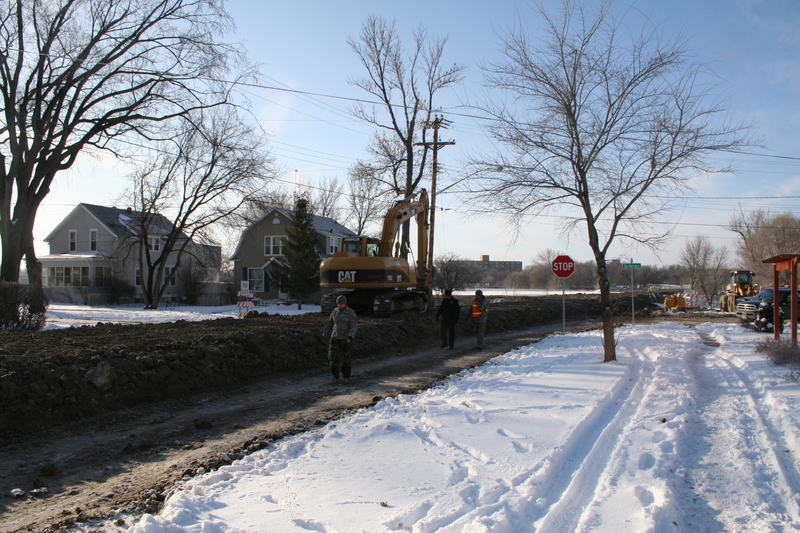 March 27: Temporary earthen dike along 14th Avenue N, Fargo, North Dakota. 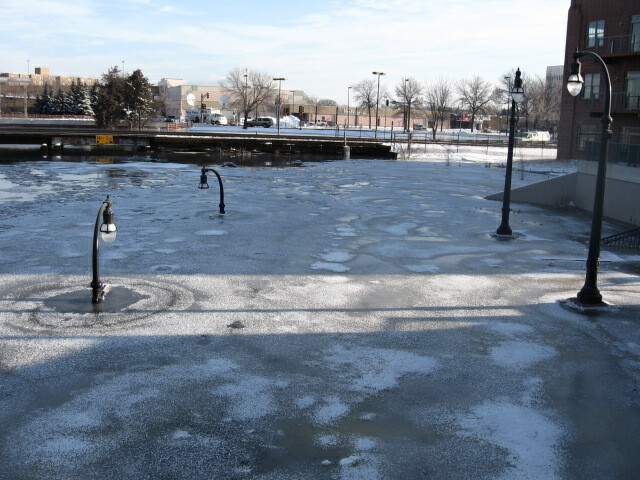 Floodwaters are frozen are opposite side. Red River stage (at Fargo): 40.7'. 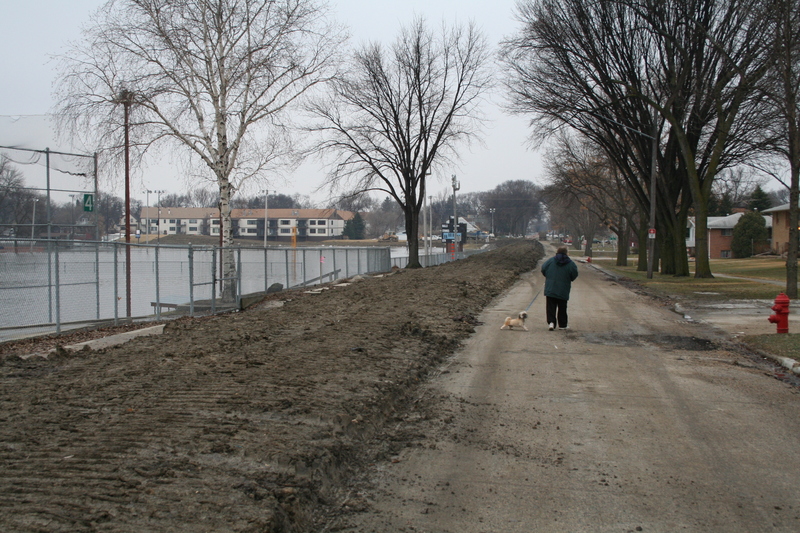 March 27: Temporary earthen dike along 15th Avenue N, Fargo, North Dakota. Floodwaters are frozen are opposite side. Red River stage (at Fargo): 40.7'. 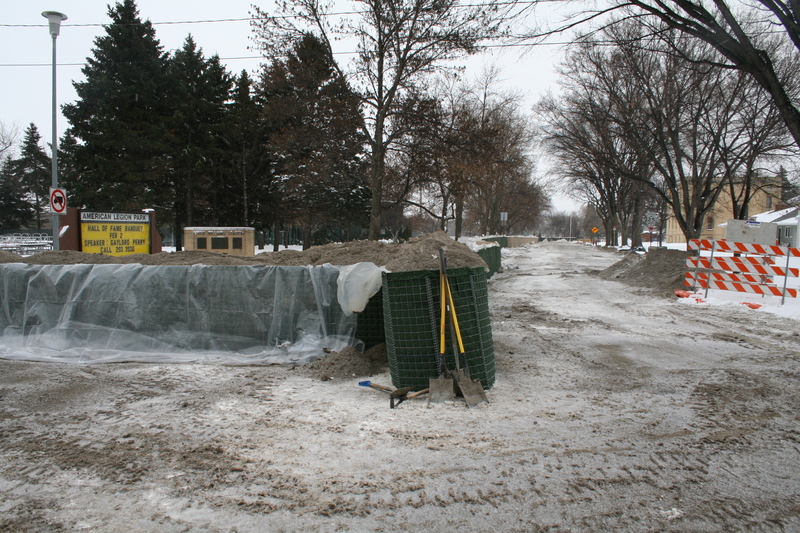 March 27: Temporary lift station (multiple pumps) along 15th Avenue N, Fargo, North Dakota. 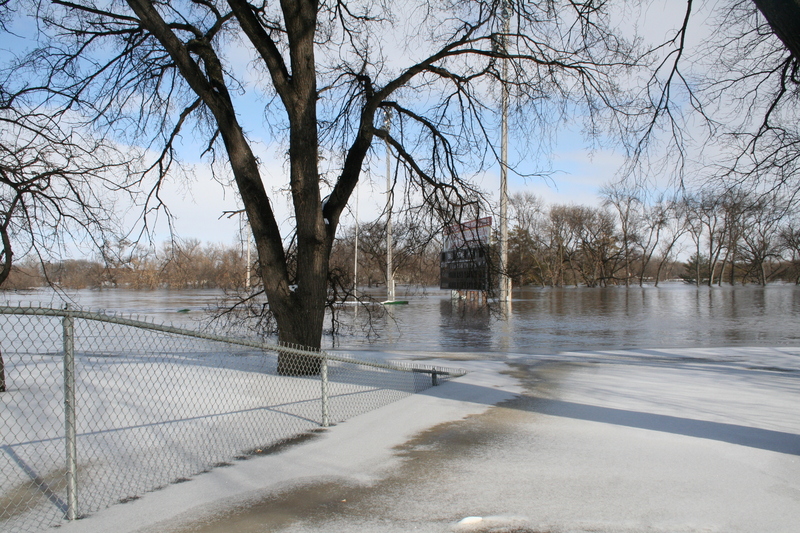 March 27: Floodwaters (frozen) covering the baseball field at Jack Williams Stadium, Fargo, North Dakota. Red River stage (at Fargo): 40.7'. 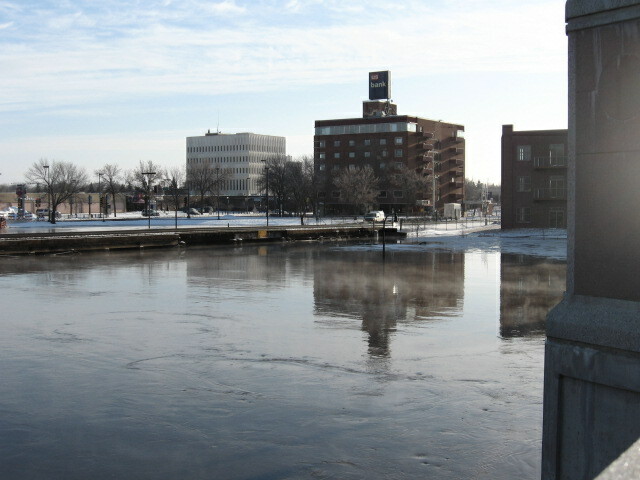 March 27: View facing southwest from Moorhead onto the Main Avenue Bridge. Red River stage (at Fargo): 40.7'. March 28: Dawn at Main Avenue bridge, Fargo, North Dakota. Just after crest. 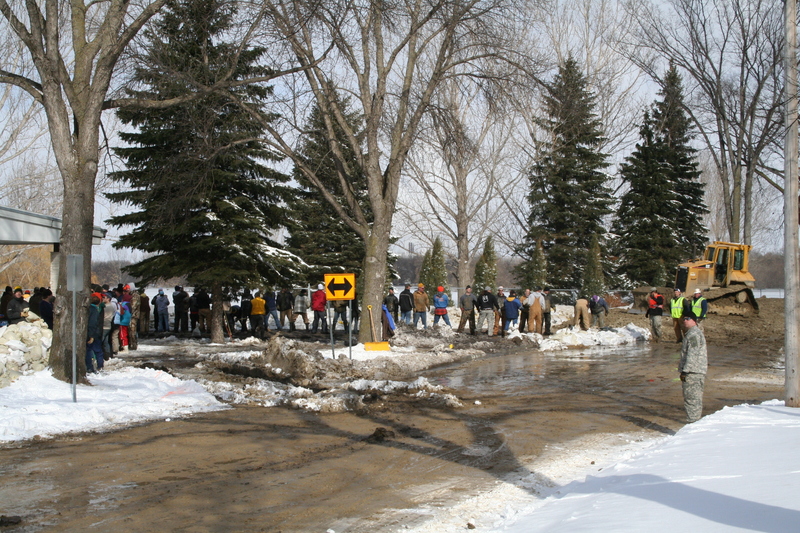 March 28: Flood just after crest at downtown Fargo. Red River stage (at Fargo): 40.8'. 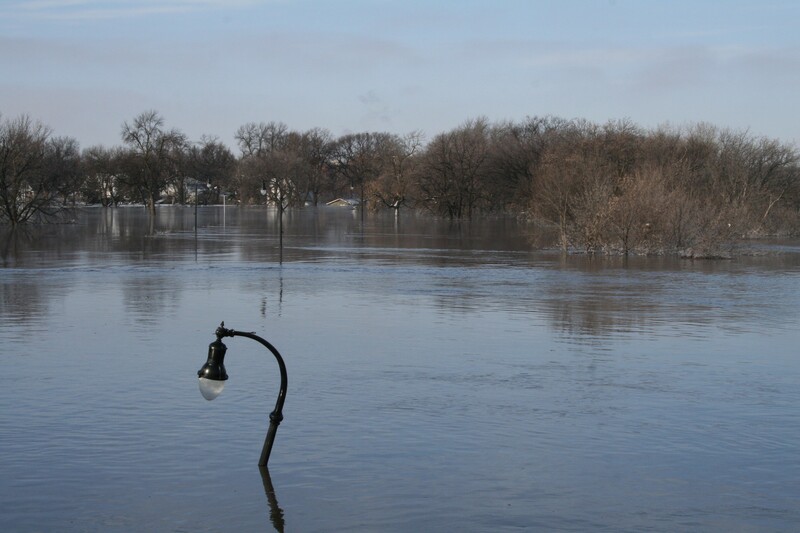 March 28: Flood just after crest at downtown Fargo, North Dakota. Red River stage (at Fargo): 40.8'. 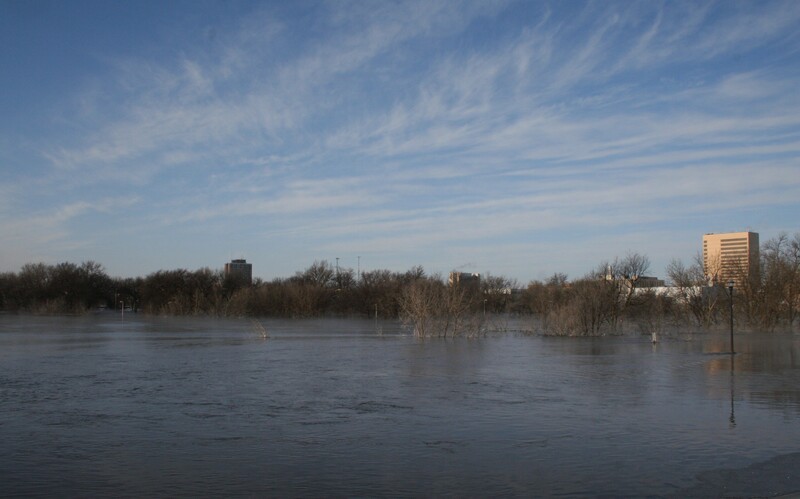 March 28: Flood just after crest at downtown Fargo, North Dakota. View includes the Heritage Hjemkomst Center in Moorhead, Minnesota (white structure, far left). Red River stage (at Fargo): 40.8'. March 28: Flood just after crest at downtown Fargo, North Dakota. View is to the south from the bridge on Main Avenue. Red River stage (at Fargo): 40.8'. March 28: Flood just after crest at downtown Moorhead, Minnesota. View is to the south from the bridge on Main Avenue. Flooded houses in the Woodlawn Park neighborhood are visible in the distance. Red River stage (at Fargo): 40.8'. 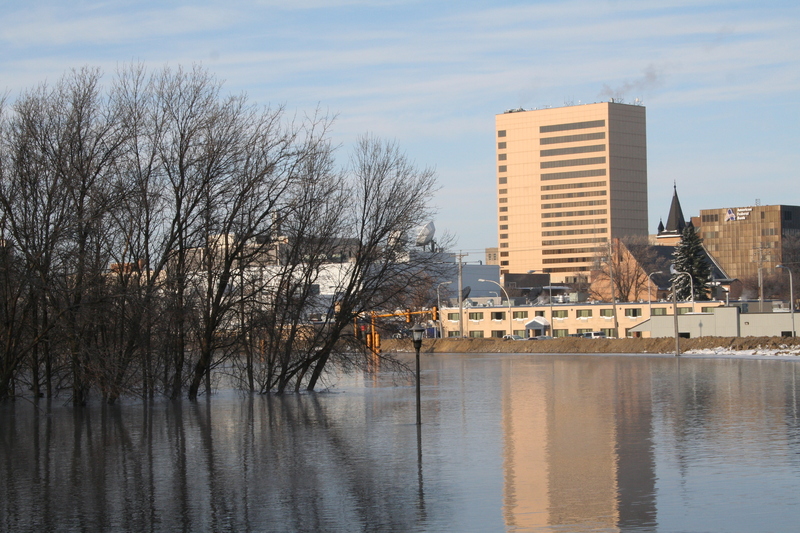 March 28: Flood just after crest at downtown Fargo, North Dakota. 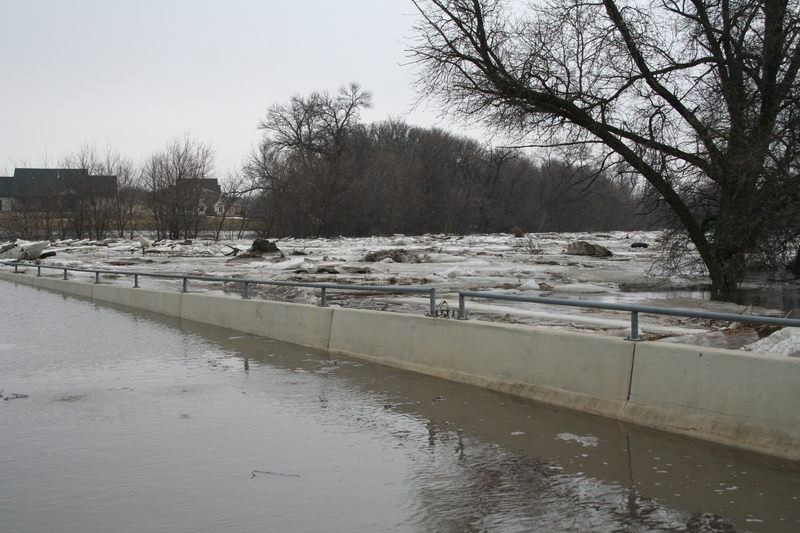 View is of the flood wall at the east end of the Main Avenue bridge. 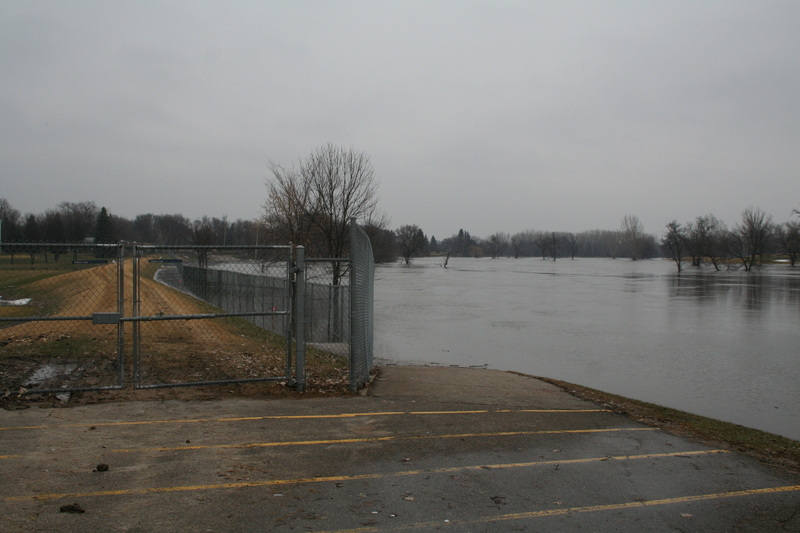 Blue structure in the distance is the temporary buildup of the permanent dike at Island Park. Red River stage (at Fargo): 40.8'. March 28: Flood just after crest at downtown Fargo, North Dakota. View is at the east end of the Main Avenue bridge. Minor leakage is occurring from flood wall to the left. Red River stage (at Fargo): 40.8'. 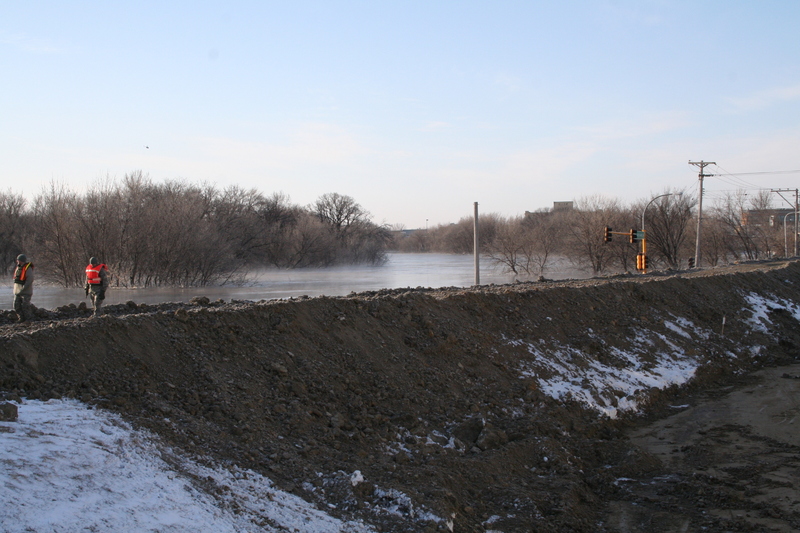 March 28: Flood just after crest along temporary earthen dike on top of 2nd Street N, downtown Fargo, North Dakota. Red River stage (at Fargo): 40.8'. March 28: Earthen diking at S. Terrace and Elm Street N, Fargo, North Dakota. 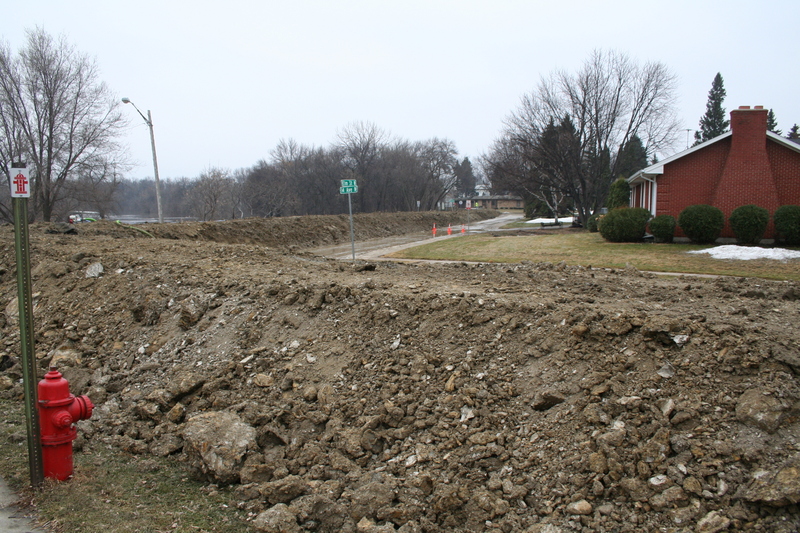 Dike in the foreground is a contingency dike lining Elm Street, should any the temporary diking in the Oak Grove Neighborhood fail. Red River (frozen) is visible in the distance. Red River stage (at Fargo): 40.8'. 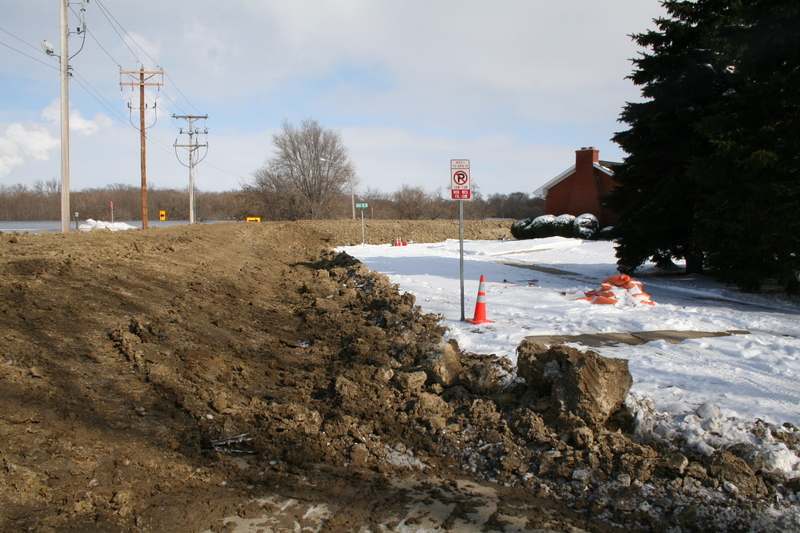 March 28: Earthen dike at 7th Avenue N and Oak Street, Fargo, North Dakota. Red River stage (at Fargo): 40.8'. March 28: Earthen dike along Oak Street N, Fargo, North Dakota. View is to the north, toward Mikkelson Field. Red River stage (at Fargo): 40.8'. 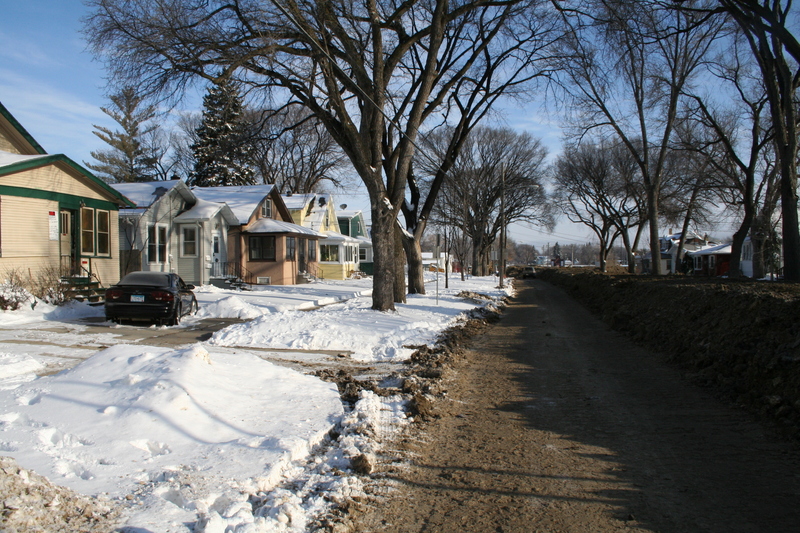 March 28: Earthen dike along Oak Street N at 8th Avenue N, Fargo, North Dakota. View is to the north, toward Mikkelson Field. Red River stage (at Fargo): 40.8'. 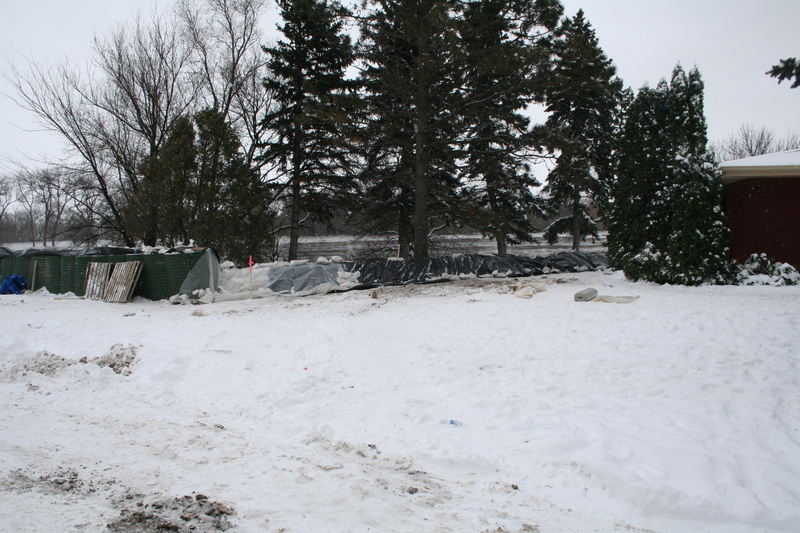 March 28: Sandbagged home, Oakport Township, north of Moorhead, Minnesota. March 28: Dusk at Jack Williams Stadium, 12th Avenue N and Elm Street, Fargo, North Dakota. March 29: Snowmen walking on water are a reliable indicator of non-normalcy. Moorhead, Minnesota. 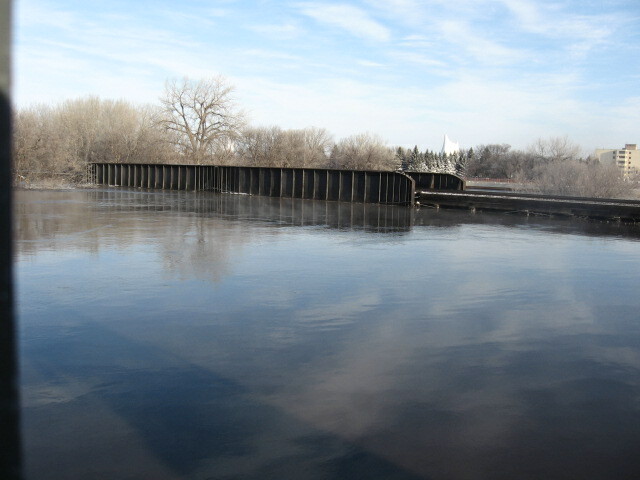 March 29: BNSF railroad bridge, Moorhead, Minnesota. March 29: Media coverage of the flood is directed to outer space from a truck parked behind a snowpile, Moorhead, Minnesota. March 29: The downtown Fargo fire station serves as a mobilization center for both military and fire department traffic. 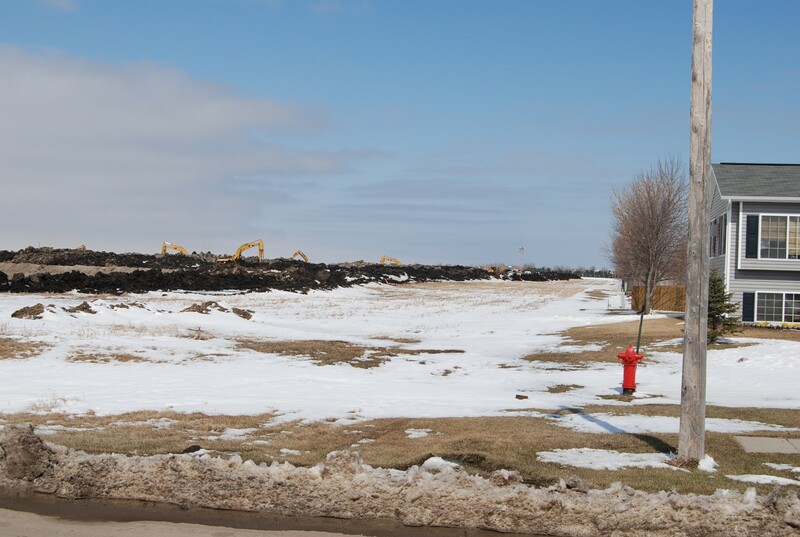 March 29: Borrow pit for clay at 36th Avenue N and University Drive, Fargo, North Dakota. 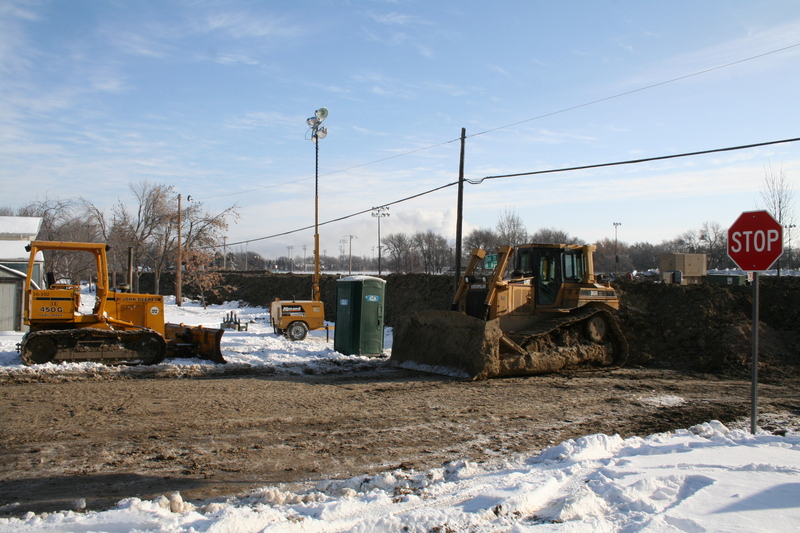 One of several massive pits being dug for clay, hauled away to build the temporary dikes. March 29: Moorhead, Minnesota. View northwestward onto flooded railroad bridge. The Heritage Hjemkomst Heritage Center is in the distance. March 29: Moorhead, Minnesota. View northwestward toward the Moorhead Center Mall. March 29: Moorhead, Minnesota. View northwestward from the Main Avenue Bridge. March 30: With strong winds expected from the north, sheeting is laid upon an earthen dike to protect it from wave erosion. Elm Street N at 14th Avenue N, Fargo, North Dakota. 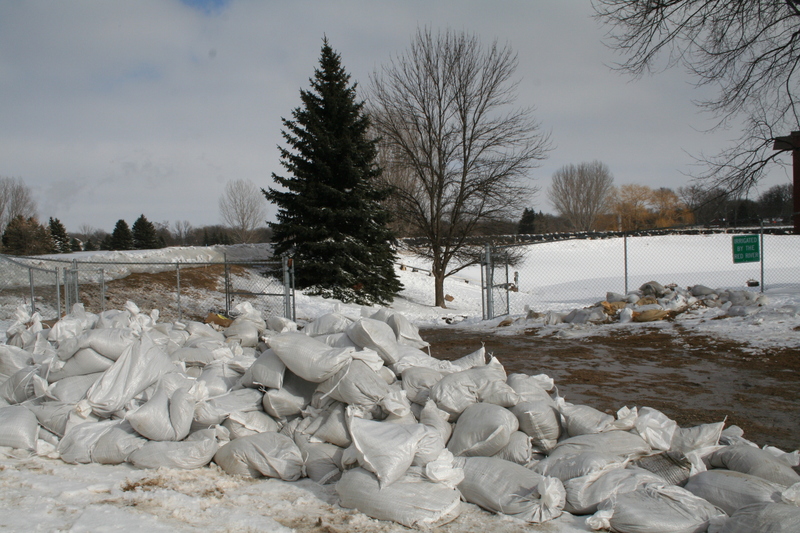 March 30: Piles of sandbags, manufactured in India, await their destiny in Fargo, North Dakota. March 30: Heavy snows associated with the arrival yet another winter storm fall upon Fargo, as the flood threat continues. These words inscribed on the Statue of Liberty's tablet seem strangely appropriate: "Give me your tired . . . "
March 31: Amidst a heavy snowstorm, reporter Karen Pauls of the Canadian Broadcasting Corporation records the reactions of Fargo citizens to the ongoing flood. 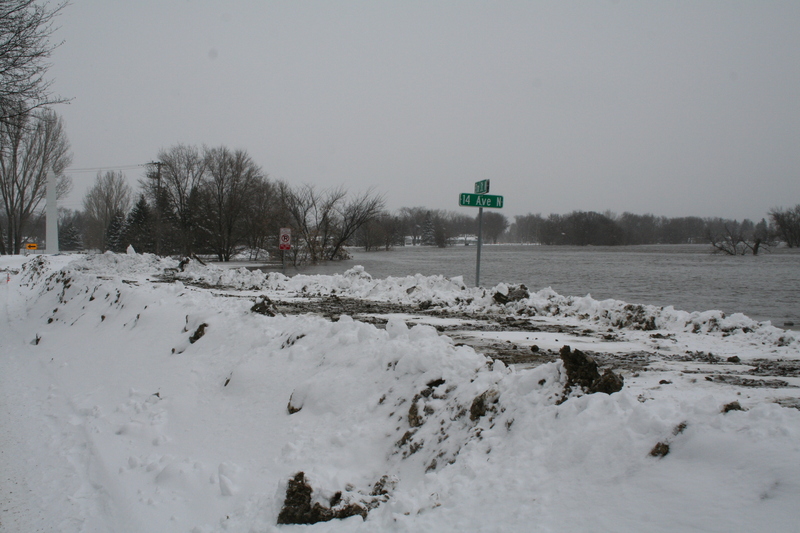 14th Avenue N. and Oak Street, just south of the earthen dike at El Zagal Golf Course. March 28: The snows leave a restful setting, as the floodwaters recede from this house in Oakport Township, north of Moorhead, Minnesota. Red River stage (at Fargo): 38.3'. March 28: Unlike their human neighbors, these birds did not need to build a sandbag dike. 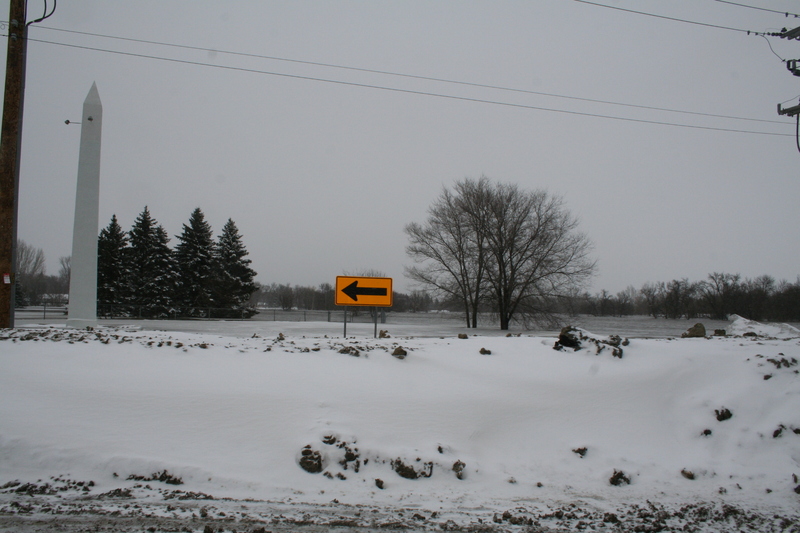 Oakport Township, north of Moorhead, Minnesota. Red River stage (at Fargo): 38.3'. March 31: View west toward downtown Fargo from the parking ramp at the Moorhead (Minnesota) Center Mall. Red River stage (at Fargo): 37.8'. March 31: Moorhead, Minnesota. View west toward Fargo along 1st Avenue N. Red River stage (at Fargo): 37.8'. March 31: Moorhead, Minnesota. BNSF railroad bridge across the river. Red River stage (at Fargo): 37.8'. April 3: Moorhead, Minnesota. 2nd Street facing toward the southwest. Red River stage (at Fargo): 35.7'.